*Thanks to Howard Silverman for several insightful posts linked below. The Individualist (low group/low grid). The Individualist is low-group (i.e., does not feel much social cohesion with others) and low-grid (i.e., does not feel the need to obey authority). 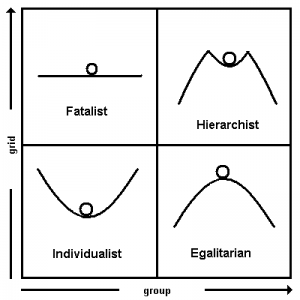 The Egalitarian (high group/low grid). The Egalitarian, in contrast to the Individualist, is high-group (i.e., strongly values social cohesion with others), but is similarly anti-authoritarian. The Hierarchist (high group/high grid). The Hierarchist is high-group like the Egalitarian, but believes that groups are best held together via authority structures, in which some people make rules and others follow them. 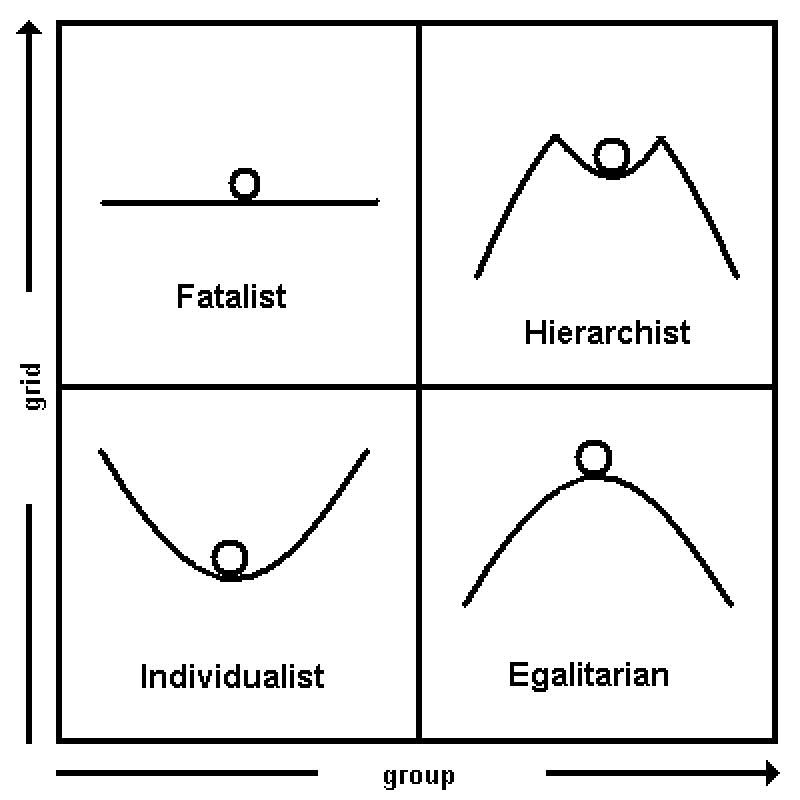 The Fatalist (low group/high grid). The Fatalist is high-grid like the Hierarchist in that they believe there are authorities over them to which they must obey; but they are low-group in not feeling much support nor closeness with others. The fatalist is thus caught in a powerless situation. Nature benign (Individualist sector): In this perception of nature, human perturbations (i.e., moving the ball) always result in a return to equilibrium; nature can always recover from human impacts (a handy mythology for the Individualist). Nature ephemeral (Egalitarian sector): With the basin now flipped, any little human perturbation of nature results in drastic and serious consequences; nature is now extremely fragile. This myth may fit the Egalitarian’s go-slow temperament. Nature perverse/tolerant (Hierarchist sector): This basin is a combination of nature benign and ephemeral, in that so long as limits are set the ball (nature) will return to equilibrium, but outside these limits disaster will happen. This myth fits the Hierarchist’s desire for rules to govern our treatment of nature. Nature capricious (Fatalist sector): This flat basin epitomizes the Fatalist position, in that nature just changes randomly with no order nor any return to equilibrium—as there is none. These typologies of values and myths of nature from grid-group theory have been applied in the environmental context is the notion of wicked problems and clumsy solutions (Lach et al. 2006; Verweij et al. 2006; Rayner 2014; see also here). In the context of wicked problems, differing grid-group values and myths of nature result in inability even to agree on what the problem is; in the context, however, of clumsy solutions, some progress can be obtained by attending to what is viewed as fair from each of the four grid-group sectors. Grid-group theory has been extended by the Cultural Cognition Project (Kahan 2008), with related applications such as U.S. public perception of scientific consensus (Kahan et al. 2011). But given its wide applicability, we have used the original eight-item grid-group instrument here as deployed in the 2000 International Social Survey Programme Environment II survey. The chart below summarizes grid-group scores for all respondents, using the four sectors (e.g., Individualist) summarized above; in which sector are most respondents so far? (The results have been mathematically transformed given the scoring of the original instrument, thus the trendlines you see below.) Compare these results to your own report, noting that “mild” vs. “strong” refers to how far your score was from the origin of this chart—stronger responses are farther from the origin. It may be difficult from the above chart to see the distribution of responses so far, as many are stacked on top of each other. The pie chart below summarizes the general grid-group type of respondents; which type is most common? the least common?